The last news about Fathom. Watch the movie trailer soon. 20th Century Fox is considering a live-action movie adaptation of Fathom, the comic book series created by the late Michael Turner. The story revolves around a young woman named Aspen who learns she is a member of a race of aquatic humanoids who possess the ability to control water (should we call her Aquawoman then?). 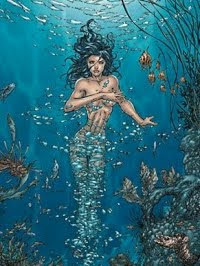 Actress Megan Fox is attached to the movie Fathom, not only as actress for the lead role as Aspen but also as producer! Screenwriter and video game creator Jordan Mechner is still working on the script. No release date has been announced. "The story revolves around Aspen Matthews, who was found abandoned on a ship and is adopted by a military man. She becomes a champion swimmer and marine biologist who comes of age realizing she has water-based powers and is part of an underwater race." "That's going to happen even if I have to step away from it and give it to someone else. That movie will happen, just because I love it and it needs to happen." I really doubt that Megan Fox would let someone else take over the role. She's been kicked out of Transformers 3 and must be looking for a new vehicle to boost her career. So I'm pretty sure she will be starring in the movie Fathom.